"Healthy Bodies, Radiant Beauty, and Positive Spirits"
Learn more about the Glow Editorial Staff and Expert Advisors and Contributors. Our team is led by Anne Akers, our editor-in-chief and senior editors Wendy Lewis, Mitch Rustad and Isabel Stolzman. Denise Jagroo, P.T., D.P.T., M.T.C., W.C.S. Luis Navarro, M.D., F.A.C.S., F.A.C.Ph. Deborah S. Sarnoff, M.D., F.A.A.D., F.A.C.P. Christopher E. Starr, M.D., F.A.C.S. Amanda Sergay, M.D., F.A.A.D., F.A.C.P. Reproduction in whole or in part is not permitted without the writte authorization of the Publisher. All reasonable efforts have been made to trace copyright holder. Glow Magazine contains general information only and does not purport to be a substitute for medical advice. All readers are advised to seek medical advice from a doctor if considering cosmetic surgery. The publisher and authors do not accept any liability whatsoever in respect of an action taken by readers in reliance on the recommendations set out in this magazine/website. Except where specified in captions, photographs depict models who have not necessarily received treatments described in this magazine/website. © 2015 MD Press, Inc. All rights reserved. 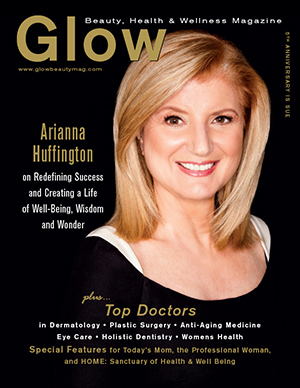 Glow Magazine is printed in the United States of America.